Are you looking to sell your house, apartment or lot? By creating your own flyer and posting it on message boards around your local area, you give yourself some fantastic exposure to potential home buyers. However, are you feeling a little unsure of how to create a flyer that catches the attention of passersby? No worries! 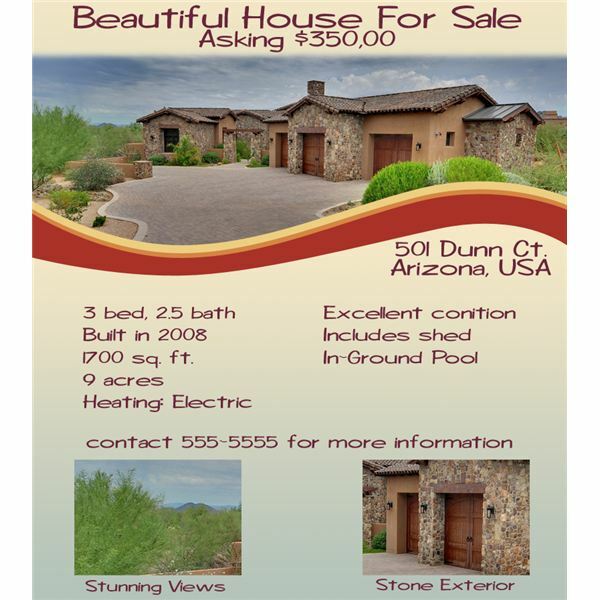 We've got some fantastic tips for designing real estate flyers that are sure to help. Learn the importance of keeping a clean layout, choosing colors that complement your photographs, and how including the right information makes all the difference in the world. There is such thing as too much information when it comes to designing a flyer. There is no reason to try to fit twenty thumbnail sized shots of the house on a page because people are usually willing to check out a house in which they are potentially interested. Sticking with a large exterior photo and three or four smaller images for houses and four medium-sized photos for apartments and land tracts is good enough. It's more important that you give them something they can see the details of rather than tiny images that leave them guessing. 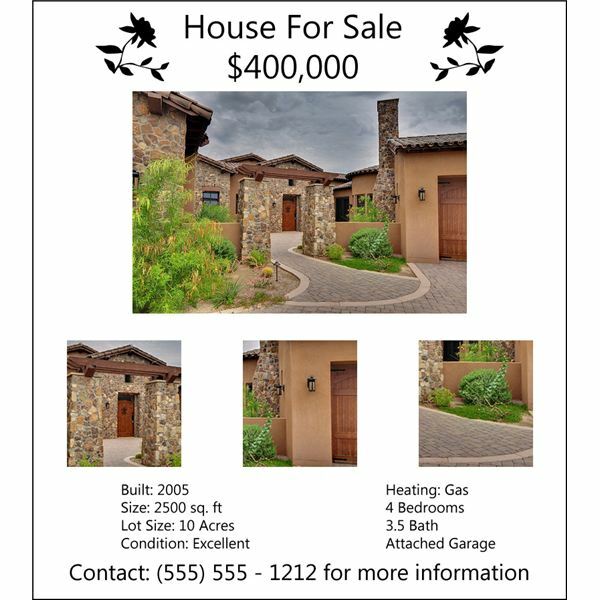 One of the most important tips for designing a real estate flyer is to know exactly what information should be included. When designing your flyer, there are a few facts you must include to help people make their decision. By including this information, you'll draw in more people as well as filter out those who may not be interested. Price: Obviously you're going to want to put your asking price on your flyer, and if you had the house appraised, be sure to include that information as well. Condition: Is your house move-in ready or a fixer-upper? 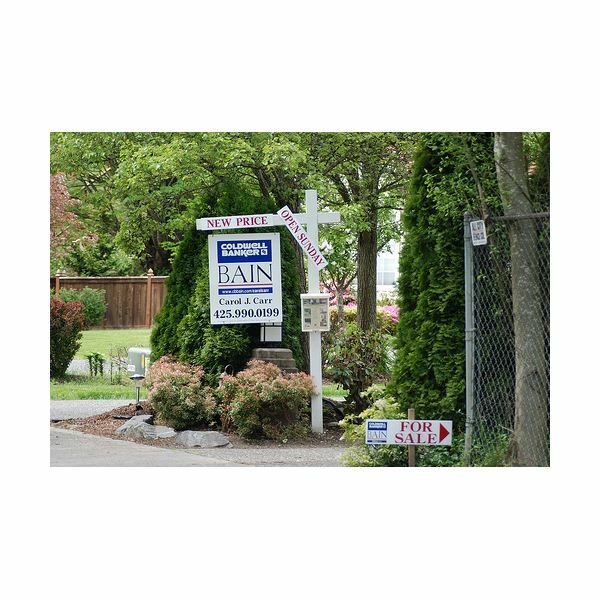 Are you selling a lot that is wooded or already cleared? Including this information allows the potential buyer to know what they are in for before they even see the house or lot. Square Footage: When selling a house or apartment, it's absolutely critical that you include the square footage. After all, size is very important when it comes to real estate because most people have a minimum square footage they're looking for. Style: While it is not absolutely critical, if you know the style of your house, including that fact can be helpful. Some people may love a ranch style house but may not be charmed by a Cape Cod. By providing this little bit of information, you help your potential viewers imagine what your house layout may be and if it meets their needs. Providing the year the home was built is a good idea as well. Heating: Be sure to tell whether the house is gas, electric, or oil heated as there are a many people who are only willing to commit to specific types of heating, after all. Acreage/Lot Size: Letting potential viewers know how much land they're going to be getting is extremely important. Number of Bedrooms and Bathrooms: The number of bedrooms and bathrooms in a house is one of the most important criteria for those looking for a house. A family may be looking for a house to grow with them, or a retired couple may be looking to downsize. Including this information not only lets them know what is available to them, but also gives them an idea of the size of the house. Contact Information: Last but not least, make sure you include your contact information. Ideally, you'll provide at least a phone number but including an e-mail address is a wise idea as well. Figuring out how to place your text is another important thing when you are choosing a layout for your flyer. While this merits a bit of creative liberty, make sure you do feature the information in a well thought out layout. Don't cram it together in a single sentence across the middle of your flyer and don't chop it up among the photos. Remember, this flyer has a utilitarian purpose: to sell something. It should be easy to read as well as pleasant to look at. When choosing a font, pick something that is easily readable because now is not the time for you to be searching for something overly creative. Fonts like Impact catch attention, while other fonts like Verdana are more subtle but look a bit more professional and offer a bit more readability. Make sure that your title font is large and easily readable from a distance as you want people to take notice of what you're trying to sell. Really, there are no hard and fast rules about picking colors for real estate flyers, but there are a few guidelines you might want to follow. If you are using highly colored photos, think about allowing the pictures to be the center of attention by picking a muted monochromatic color scheme. This allows the eye to be drawn into your flyer easier, but on top of that it also prevents the viewer from being too overwhelmed. If you're using black and white images or images with muted color schemes, you can go a little bolder with your color schemes. If these flyers are going to be posted on public boards, you want to make your flyer stand out and get some attention. Picking a triadic color scheme or an analogous color scheme helps you create a bold but not overwhelming design that is sure to get you more viewers. Choosing a nice, subtly colored paper can do a world of good as well. If you're part of a real estate agency, you'll probably want to look into featuring – at the very least – a color version of your logo somewhere on the flyer. However, designing your layout around your logo color scheme can achieve a stunning effect as well. All flyer designs done by Amber Neely.